Agriturismo Torre del Golfo offers accommodation in self catering apartments for your holiday by the beach in Calabria. The apartments rooms are large and comfortable and the kitchen is fully equipped. In case you don’t feel using the kitchen, we offer on request breakfast and you can taste typical Calabrian food and Pizza’s in a few good restaurants in the near village of Cropani Marina. bilo apartment of 55 square meters on two floors, entrance and kitchen / living room with sofa bed and single bed on the ground floor, bedroom and bathroom with shower on the first floor, for 2-4 people. The room on first floor is open on the staircase as a mezzanine. The rooms are all air-conditioned, outside there is a patio with pergola facing the garden. There is free WiFi. bilo apartment of 40 square meters, all on ground floor, with kitchen / living room with sofa bed, bedroom with double bed and a bathroom with shower, for 2-4 people. The rooms are all air-conditioned, outside there is a roofed patio with table and chairs, facing the path to the beach. There is free WiFi. trilo apartment of 75 square meters on two floors, entrance and kitchen / living room with sofa and a single bed on the ground floor, 2 bedrooms, terrace and a bathroom with shower on the first floor. One bedroom has a double and a single bed, the second one has two single beds, the apartment is for 3-6 people. One bedroom and the kitchen are air-conditioned, outside there is a patio with pergola facing the garden. There are is free WiFi. 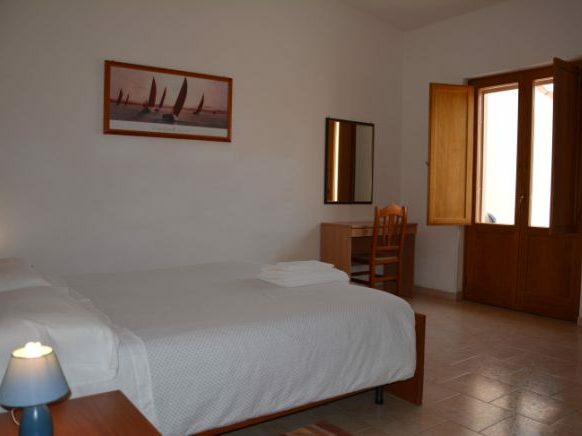 is our larger apartment, sleeps up to 9 people, measures 110 square meters and is on two floors. On ground floor there are the entrance and kitchen / living room with sofa, on first floor there are 4 bedrooms, 2 terraces with sea view and 2 bathrooms with shower. Two bedrooms have a double bed, one has two single beds and the fourth one has 3 single beds. The kitchen-living room is air-conditioned, outside there is a patio with pergola facing the garden. There is free WiFi. mono of 30 square meters, there is a bedroom with a double and a single bed, bathroom with shower, there is no kitchen, but there are in the room a fridge, a microwave, a boiler. There is climatization, in front of the entrance there is a patio with pergola facing the garden, with table and chairs. There is a library with international books and guides on Calabria that you can borrow, and in the room children and adults can find social games to entertain themselves. The garden is a place to relax during your holiday, with lemons, pomegranates, jacaranda, pittosphorum, and other plants offering their colors and fragrances. Tall Cypress and Palm trees create a desired shaded area in the hot summer afternoons. There is a playground reserved for the children, but all the garden becomes an enjoable set for children games where they can feel free to run and play also football or volleyball. There is also a table tennis table available for the guest. On the farm there are kilometers of trails where you can be able to jog or just stroll. For those who want to try their hand at cooking in the open, there is a barbecue area where they can prepare their own grilled meals.